We invited you to take a glance at the programs we are offering for the month of November. Give yourself the gift of some time away from day to day busyness to enjoy the beauty of the earth community and our place in it. Peace on earth begins with us. There will be prayer, reflection, time to walk and be quiet. A simple lunch of soup and bread will be included. Please dress for the weather and wear comfortable shoes as part of this program will be outside. Who has been involved in eco-justice for over twenty years. Please register for the above programs by calling (614) 866-4302 or through our calendar, https://bit.ly/2lWhqyq. Mark those calendars! We will be vending our crafts at the bazaar. You’ll find our basil garlic vinegar, crocheted potholders & critters, wood cutting boards, and more! We will even have bottles of our 2018 maple syrup for sale at the bazaar only! There will be over 100 vendors and we hope to see you there. Fall Craft Show: See you there! 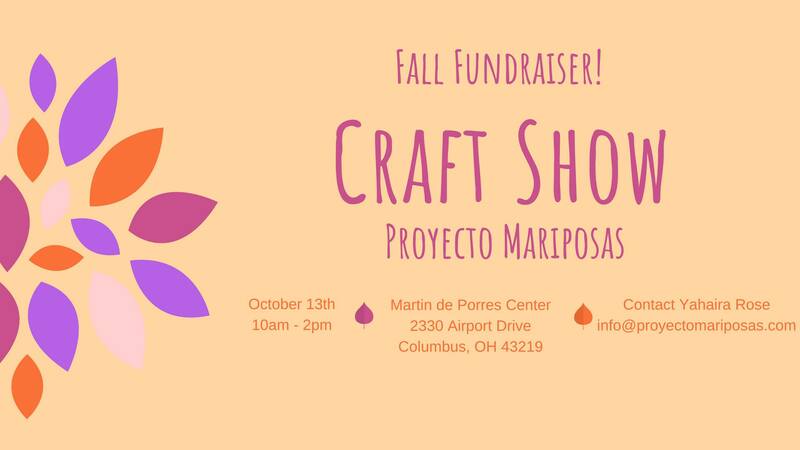 Join us at the Proyecto Mariposas craft show this Saturday, October 13th. The craft fair, which features many vendors, will be held from 10:00 am to 2:00 pm.